Price is per 34-inch long strand of these unusual beads, drilled ready to thread. Largest bead measures about 7mm x 6mm. The name chrysoprase (rhymes with bliss and craze) is from a Greek word meaning Golden Leek. It is the rarest of the chalcedony group of gem quartzes and its bright even color and texture is ideal for beads. 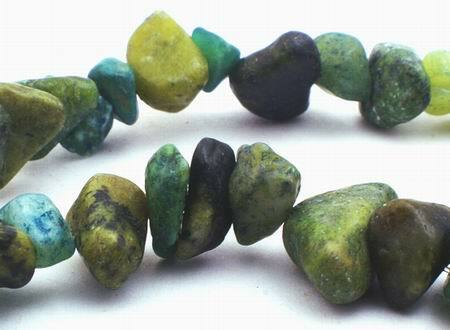 Chrysoprase was popular in the time of the Greeks and Romans when it was cut into cameos - the Egyptians used it with lapis jewelry and even to decorate beads. In Europe until the middle of the last century it was used lavishly, when deposits mined in Silesia exhausted and it became expensive. The Book of Revelations (21:20) describes the holy city of Jerusalem with its 12 walls decorated with precious gemstones, the tenth being chrysoprase. According to an 11th Century Byzantine manuscript, chrysoprase strengthens vision and relieves internal pain. Metaphysically, it brings a sense of grace, helping meditative, calmness and acceptance of oneself and others. It is believed to encourage positive outcome, helping to heal a broken heart, the heart itself, the reproductive organs, and fertility. And in the East, Chrysoprase is said to balance yin-yang and encourage the heart chakra bringing energy to the physical body. Astrologically, chrysoprase is associated with the zodiac signs of Gemini and Cancer.